Football Star online pokies is the perfect game for sports and soccer lovers. 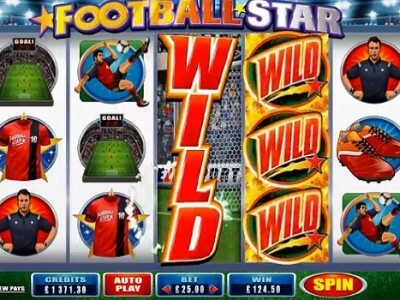 Played over 5 reels Football Stars offers 243 ways to win, big jackpots and a fantastic bonus feature. In this game the symbols depict images of five football stars: passing, shooting, heading, defending. This game has a special rolling reels feature where after a winning combination the winning symbols expload through animated action for even more thrilling football action. You will also find symbols of the umpire, soccer stadium, a football jersey, and a pair of football shoes. The football itself is a scatter symbol and the Football Star Logo is a wild symbol. Look out for the The Football Star Logo which acts as the wild symbol substituting for other symbols to create winning combinations. As an added bonus the wild is is stacked on Reels 3, 4, and 5 which can create some very big wins. At random the The Striking Wild feature can hit at any time. A football star will step out in front of the online slot machine and kick the soccer ball to turn an entire reel wild, guaranteeing a win. As already discussed the Rolling Reels feature ensures after every win the symbols will explode in a great ball of fire and the reels will roll to fill in the now-empty spaces with new chances to spin up a winning combination. Effectively you can win multiple times on the one bet. The best payouts come from the free spins bonus. Three or more Football scatter symbols is the key to triggering up to 25 free spins. These free spins have Rolling Reels with an added bonus: a multiplier trail. With enough consecutive wins, your multiplier value could reach 10 times the standard payouts. Overall if you love an action packed sporting slot then Football Star online pokies is the game for you.